Over the two-and-half-centuries since Bach’s death his music has been likened to many different mechanical devices, from clockworks (generally a positive comparison) to sewing machines (a decidedly negative one), but never, as far as I know, to high performance Italian motorcycles. I’m not going to make the comparison here, but it did occur to me some thirty years ago as I strolled through an exhibition of dangerous-looking Ducatis set up in the vast nave of Amsterdam’s Nieuwe Kerk (consecrated in 1409 and therefore newer than the city’s Oude Kerk). As I admired these sleek racing beasts, an unseen organist in the distant West End Gallery started into Bach’s Passacaglia in C Minor. It wasn’t motorcycles but the organ that roared to life. The Passacaglia is one of Bach’s great achievements, bewildering in its complexity and beauty, thrilling in its logic and ambition. It is also a youthful work, composed some time between 1706 and 1713 when the composer was in his early twenties. Looking back to earlier models and the work of Bach’s teachers, it absorbs the old into a fierce vision of the new, combining a tour-de-force summary of the keyboard arts with audacious experimentation in compositional and performance technique. In the winter of 1705 the twenty-year-old Bach had travelled north to the Hanseatic city of Lübeck on the Baltic coast, on foot (no screaming Ducati on the Autobahn for him). He had asked permission from his church in Arnstadt in central Germany to stay away for four weeks, but didn’t return for four months, missing Christmas along the way. Yet the church did not see fit to sack him. Bach’s purpose was, as he told his employers when called to account for his absence, “to learn one thing and another about his art.” The teacher of those things was the venerable Dieterich Buxtehude, two years shy of his death. 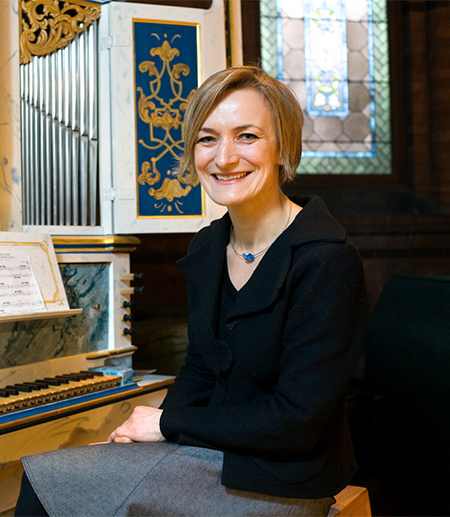 One of the famed modes of Hanseatic organ display was the passacaglia, originally a Spanish dance built on a repeating bass line—an ostinato—over which a series of variations plays out in the upper voices. In principle it’s one of the simplest approaches to music-making, one that crosses all kinds of traditions, from folk to jazz and beyond: keep the bass-line going and do something different above each repetition of the pattern. Bach brought back to central Germany choice examples of these bass-driven works; indeed, those that remain from Buxtehude survive because of Bach’s efforts. The earliest source for Bach’s Passacaglia is to be found alongside Buxtehude’s music in the Andreas Bach Book, a collection of music copied by Bach’s brother who, for some inexplicable reason, turned the book 180 degrees to write in the Passacaglia. Perhaps he was expressing with that act the brazen truth that he and every other organist hears in the piece: a great work turns the world upside down. Like the acceleration and maximum speed advertised on the Ducati exhibition labels, there are the facts of the piece: it is longer and more complex than any of its predecessors. And then there’s the way it lays out its theme, merely the abstraction of an idea, alone in the pedal—a new way to begin such a work, almost ostentatiously simple, but one that is also a challenge. There have been ostinatos before (and since), but this piece is the watershed moment in the genre’s history, and the opening’s apparent modesty will be unmasked as unprecedented artistic arrogance: “I will take this raw material and do things no one else can imagine and no one else has the skill to realize.” This audacity’s result has stunned and baffled performers and musicologists since: how could a young man do this, even one so dedicated to the study of his forbears’ efforts? Not only is the music notated upside down, but the principles of construction are also inverted. The organ ostinato is defined by the hegemony of the bass line, but in the course of this work it is as if the old form cannot hold the imagination of the young iconoclastic composer: the ostinato breaks free, migrating up through the texture first into the tenor, then the alto, then up to the soprano. It is absorbed into virtuosic scales and broken chords, veiled yet audible as it escapes its anchoring role in the bass, dispersed across the texture, to vanish off the very top of the keyboard into momentary silence. The overthrow of the regime is made decisive with the outbreak of the fugue, after 21 variations, at the central fissure of the piece. The familiar passacaglia theme is recast as the subject for what will turn out to be a monumental display of contrapuntal expertise. The notes are unchanged, and yet the ground has shifted under them: the theme’s role is now no longer to provide an anchor for variations above and around it; instead this simple sequence of notes will itself be subjected to every kind of combination and permutation in a hyper-virtuosic display of invention. If the unfolding variations of the passacaglia present Bach’s brilliant summary of contemporary keyboard art, the fugue that follows stakes out the untrodden territory of his own intellect and imagination. The momentum becomes almost unbearable until the cataclysmic derailment a few measures before what turns out to be the close: a Neapolitan chord, coming after a jagged sprint of pedal notes, shatters into the echoing silence of the vaults of stone and lead-glass. Why and for what purpose make a thing so good and so unsettling? In this work, Bach’s genius is visible on the page in whatever orientation notated, but the effect is almost frightening on an ancient and magnificent organ like that in Amsterdam’s Nieuwe Kerk. Every bit the match for the technological marvel and sleek beauty that is the Ducati motorcycle, this late seventeenth-century collaboration among the leading architects, painters and organ-makers of the age, is itself a combination of imposing artistic ambition, technological sophistication and luxurious excess—a stunning contrast to the small organ on which I had learnt the Passacaglia, in the medieval chapel of my Oxford college, a month before visiting Amsterdam. The music, the mighty machine creating it, and the building in which it resounded generated a visceral thrill that knocked me off course toward a career thinking, writing, and teaching about music – and playing the organ works of J. S. Bach. How to account for the audacity and ambition inherent in this work, its qualities of concentrated thought and profound expression, its power to move and capacity to connect its listeners, its rootedness in the physical world – all of it invisible in the performed moment? In that church in Amsterdam I realized what art can do when it jumps its track from abstraction and beauty—into the awe-inspiring truth of sound in space. Faculty in the College of Arts & Sciences share a belief in, and speak often with our students, their parents, and the broader public about, the importance of the humanities for shaping deep and meaningful human lives. These short reflections by our faculty illustrate — in concrete and personal ways — how encounters with the stuff of the humanities have in fact been transformative in their own lives. In composing these reflections faculty were responding to the following assignment: Pick a single work in the humanities that has profoundly affected you — that inspires you, haunts you, changed the way you think about things, convinced you to pursue your life’s work, redirected your life’s work . . . in short, a work that has made your life in some way deeper or more meaningful. This reflection is one of the many thought-provoking and inspiring faculty contributions to the “Transformative Humanities” project, part of the College of Arts & Sciences’ New Century for the Humanities celebrations. Read more of them on our New Century for the Humanities page.